The World Chess Federation today announced the pairings for the tournament that will determine the next challenger for World Champion Magnus Carlsen. The 2014 Candidates Tournament starts a month tomorrow, with Viswanathan Anand - Levon Aronian the pick of the first-round ties. Total prize fund = 600,000 Euros. The winner will play a World Championship match against Magnus Carlsen. The draw has now been completed, and although the pairings are in a sense unimportant - after all, the players play each other twice with the colour of the pieces alternating - they still throw up some talking points and make the upcoming event much more real! At first you might think it's an odd coincidence that the four Russian players in the event (who make up half the field) play only each other in Rounds 1-3 and then 8-10, but in fact the draw was deliberately "rigged" to ensure that happened. The point is to discourage collusion between players from the same country, as it's less likely it will be clear who they should "help" at the start or with four rounds still to play. Of course if a Russian player wins that won't stop conspiracy theorists speculating, but it does hark back to famous Candidates Tournaments past. 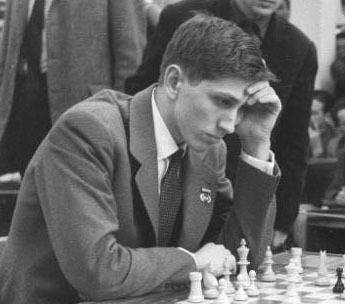 The tournament system was actually replaced by matches due to the vehement protest of none other than US World Champion Bobby Fischer, who entitled a notorious article in Sports Illustrated, The Russians Have Fixed World Chess. There was open collusion between the Russian players. They agreed ahead of time to draw the games they played against each other. Each time they drew they gave each other half a point. The tournament winner, Petrosian, got 5 points of his 17 total this way. They consulted during the games. If I was playing a Russian opponent, the other Russians watched my games, and commented on my moves in my hearing. Then they ridiculed my protests to officials. They worked as a team. Spectators will have to wait until Round 6 for perhaps the most eagerly-anticipated encounter of the tournament - Veselin Topalov-Vladimir Kramnik. That will be the first World Championship showdown between the Bulgarian and the Russian since their 2006 match in Elista, Russia descended into the farce of a "toilet war" scandal. Topalov and his manager Silvio Danailov continue to claim that Kramnik cheated and the players have never shaken hands since. For less personal reasons Levon Aronian (Armenia) - Shakhriyar Mamedyarov (Azerbaijan) in Round 2 will also have more than usual at stake - their countries are still technically at war - while there will be other flashbacks to matches past. Kramnik and Topalov will have the chance to take revenge for their World Championship losses to Anand in 2008 and 2010 respectively.